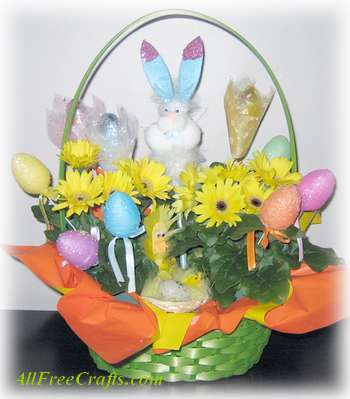 Here’s an Easter basket that you can put together very quickly using two pots of gerbera daisies. Other pots of fresh or silk flowers would also work well, depending on what you already have and what you want to buy. I happened to find these pretty gerbera daisies on sale at Walmart on the first day of spring; after Easter, when the ground warms up, I’ll be planting them outside. Note: You can easily change your selection of things to add to this daisy basket. Discount stores have tons of cheerful Easter decorations to choose from at reasonable prices, so indulge your creative side and pick some decorations to mix and match. Have some fun assembling your basket. If your flowers came already wrapped in cellophane or bright wrapping paper, simply place the pots side by side inside the basket, adjusting them so that the best display of flowers faces the front. If your flower pots are plain, either wrap each one in a generous square of decorative paper or place the pots in the basket and top with Easter grass. Position the central figure (in my case, this was a pom pom Easter bunny sitting atop a tall pencil). This piece should stand taller than anything else and be centered in the basket. Add the glitter egg picks, placing three on each side. Just insert the picks in amongst the leaves of the gerbera daisies. Add the chocolate rosebud picks or rosebud eggs. Finally, position the little nest of chicks, or a similar decoration, at the center front of the basket.